Looking for natural hair care with a hair and scalp shampoo that maintains good hair condition? Many people want a shampoo based on natural ingredients that can keep hair healthy, soft, luscious and easy to manage and leave your scalp feeling clean and comfortable. At McArthur Skincare we know that both hair and scalp need to be well maintained - they go together as far as health and well-being are concerned. It’s easy to forget the importance of scalp care because the scalp is usually a ‘hidden’ area. The truth is the scalp can overheat, may retain moisture when the weather is humid or rooms are steamy, and it can suffer in other ways in stuffy or smoky environments - all these events are usually overlooked. Scalp problems - itchiness, flaking and dandruff - are often a hidden secret that’s embarrassing at times. An irritated scalp can be uncomfortable to live with - and can disturb your sleep. McArthur Skincare's Scalp Care Shampoo has been created to keep hair and scalp healthy, and with regular use provides an ideal hair and scalp care routine. 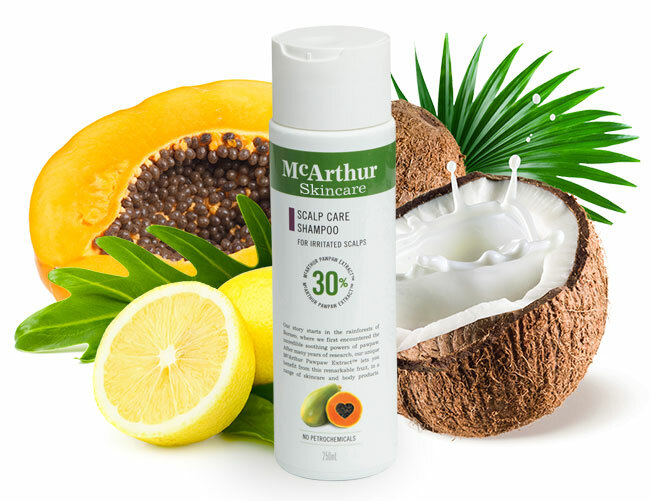 Containing a high concentration of 30% McArthur Pawpaw Extract™, our McArthur Skincare's Scalp Care Shampoo is specially formulated for use on sensitive, dry, flaky or itchy scalps. Packed full of antioxidants, this soothing shampoo uses the special qualities of Pawpaw (Papaya, Papaw) to gently clean hair and exfoliate the scalp, reducing flakiness and providing beautiful, healthy looking hair. No fragrance has been added to McArthur Skincare's Scalp Care Shampoo so this product is suitable for the most delicate scalp. Main active natural ingredient: Pawpaw (Papaya, Papaw). McArthur Skincare's Scalp Care Shampoo also includes active ingredients derived from; Coconut, Citrus Fruits and Olive Oil. At McArthur Skincare we perfected our unique McArthur Pawpaw Extract™ to capture the power of Pawpaw (Papaya, Papaw) in a concentrated form. Our products contain higher concentrations of Pawpaw than other skin and haircare products – just compare! We are dedicated to helping you feel and look your best naturally. McArthur Skincare is the exclusive producer of McArthur Pawpaw Extract™. There’s no need to live with hair problems or an irritable scalp when you can use McArthur Skincare's Scalp Care Shampoo to maintain a healthy routine for hair and scalp health, while helping manage, defrizz, untangle, and restore your hair to health and shine using a shampoo based on natural ingredients. All products in the McArthur Skincare hair care range use natural ingredients. 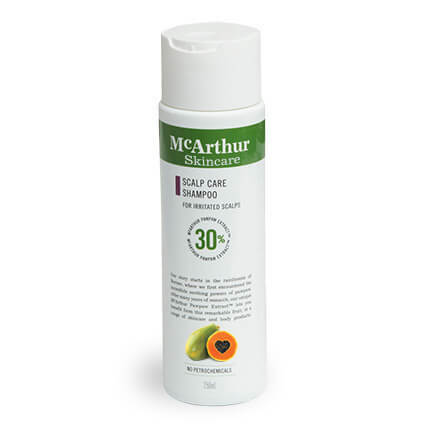 Please keep McArthur Skincare's Scalp Care Shampoo stored at a temperature below 30° Celsius.